It has been a while my friends. It is tough to find WiFi in the North, no Tim Horton, no McDonald and no Starbucks. 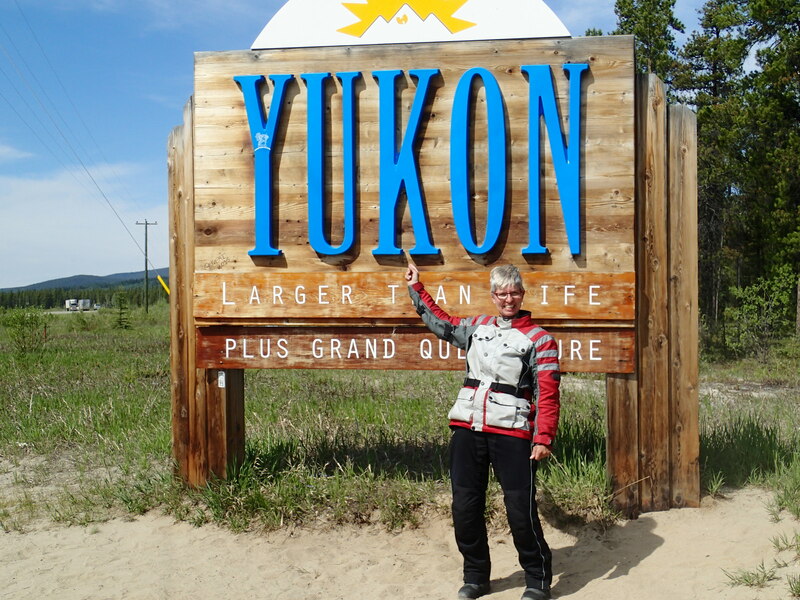 We made our way along the Alaska Highway from Fort St. John to Whitehorse in three days. Friday we stayed at a lovely campsite at Summit lake (Stone Mountain Provincial Park). 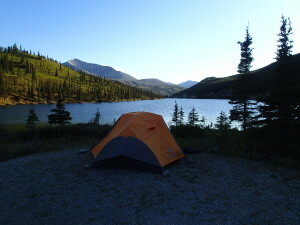 It was an open campsite right at the lake, elevation 1300 m and no mosquitos. And my prayers were heard. There was frost overnight and the bikes were covered in ice – take that you damn mosquitos. After another gorgeous riding day we stayed at Watson Lake Campground near Watson Lake (The gateway to Yukon). 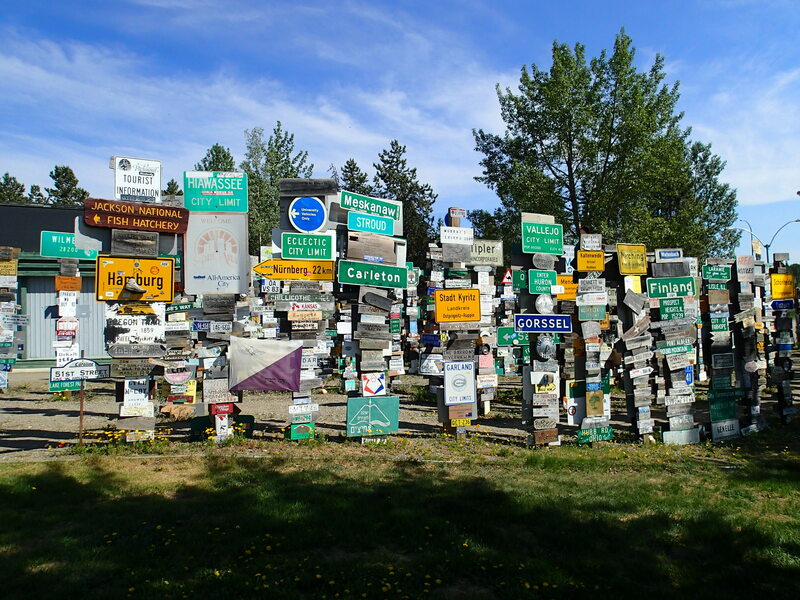 Watson Lake is also famous for the Signpost Forest. 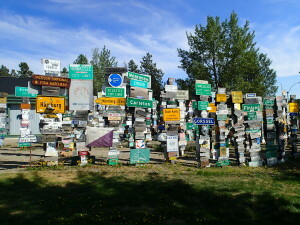 The Sign Post Forest is Watson Lake’s most famous attraction. Travelers from around the world have been bringing signposts from their hometowns to the Sign Post Forest since 1942 and continue to do so today. The tradition began during the Alaska Highway Project in 1942, when U.S. soldier Carl K. Lindley spent time in Watson Lake recovering from an injury. A commanding officer asked him to repair and erect the directional signposts, and while completing the job, he added a sign that indicated the direction and mileage to his hometown of Danville, Illinois. Others followed suit, and the trend caught on. In 1990, a couple from Ohio added the 10,000th sign in the Signpost Forest. Today, there are over 77,000 signs in the Forest, and the number grows each year as visitors contribute signs and continue the tradition. The Town of Watson Lake maintains the site, adding more sign posts as they fill up. It was amazing to see that there are so many German signs. The whole of Yukon seems to be full of Germans – oh noooo. There is actually a direct flight from Frankfurt to Whitehorse – unbelievable. We met a lot of Germans on the road so far and they love it here. At the visitor centre in Watson Lake all staff members were fluent in German language as well. I always thought Yukon is part of Canada, but I think it might be a part of Germany :). There was a stretch on the Alaska Highway where we saw a herd of Wood Bisons. 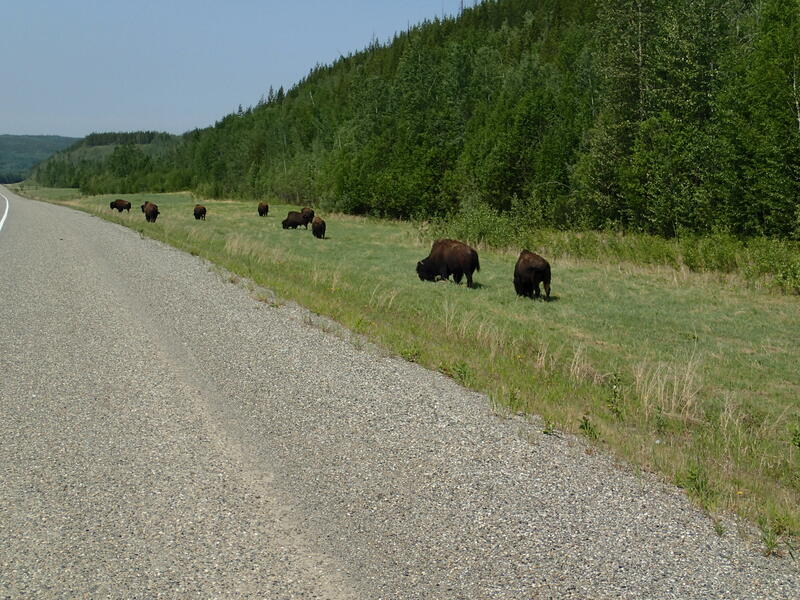 It is the onlyherd of Wood Bisons in British Columbia. Back in 1800 there used to be over 150 thousands Wood Bisons in BC. In general it has been very dry and warm up here this year and the whole West of Canada did not get a whole lot of snow, so it is going to be a challenge with forest fires. Far more dangerous than the Bisons are the wild transport trucks on the Alaska Highway. Two days ago a truck swerved right into our lane and pulled back the last second. Maybe he was texting or falling asleep but that was pretty scary. We arrived yesterday at Bill and Emily’s place in Whitehorse. Bill is the son of one of my best friends: Curlie and Jan in St. Thomas. First time we meet them here and what a nice couple. 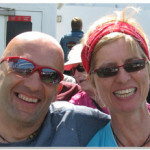 Bill is a Highschool teacher here in Whitehorse and Emily is a social worker. Whitehorse seems to be a vibrant city – we will explore more of it today and tomorrow. Dawson City is fun, not to be missed. As you enter you will see miles & miles of snaking gravel ridges, the detritus of dredging for gold. Up the Dempster, Tombstone Park has fabulous hiking. After Dawson City the next gas is at Eagle Plains… 400 km… hope you have the range! Late to the party Heinz – There was a biker rally in Delaware yesterday which reminded me I should connect – Fabulous website – Awesome narrative – You guys rock – Stay safe – Love Davey & Sue!!! Thank You Dave, love you guys too. Great to hear from you and Bill that you have met and spent time together . You have all heard many stories of each other . We love it here. You did a good job raising two wonderful kids. And we love Emily as well, what a great couple. Bill by the way is looking into buying a motorcycle. We will leave tomorrow for Dawson. I hope you guys are doing well (it really seems like it!) and I also look forward to reading your posts and seeing the pictures. I got a pretty good laugh out of Dan’s last post, i bet you did too. Met the goats and almost wish I hadn’t as you get attached to them real quick, especially Gordie, I think, who is just about the most personable goat I’ve ever met(not a long list though). Anyway just wanted to say Hi and let you guys know you are missed here from everyone and we’re all happy to hear and continue reading all about it!